Update: this article has been edited for grammar. Update: RMAA results for Alien 1: RMAA Shosy Alien 1. 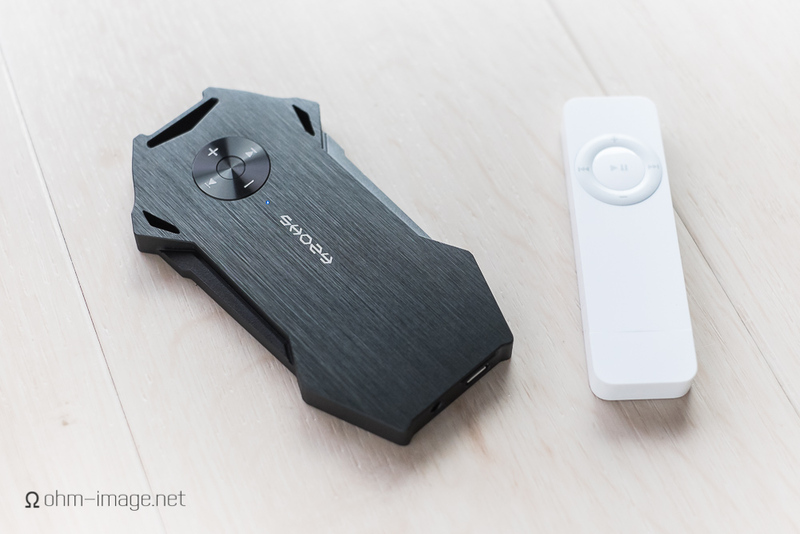 For years I've had a hankering for a screen-less audio player that was small, friendly, and sounded great. Something that could replace, or complement, my original iPod shuffle. In 2006, Apple ruined the shuffle series. The 2nd generation shuffle sounded poor, hissed more than the first generation, and frequently got lost in the wash or broke its clip. Worse yet, it required a cable. The Tera Player (here seen on a website that the 1990s rejected) attempts the small and the great-sounding. But unless you're prepared to cough up around 2.000- bones and something quadruple the size of the original shuffle - not to mention being limited to .WAV files, etcetera and so on, the Tera isn't the player you're looking for. Other players have come and gone. 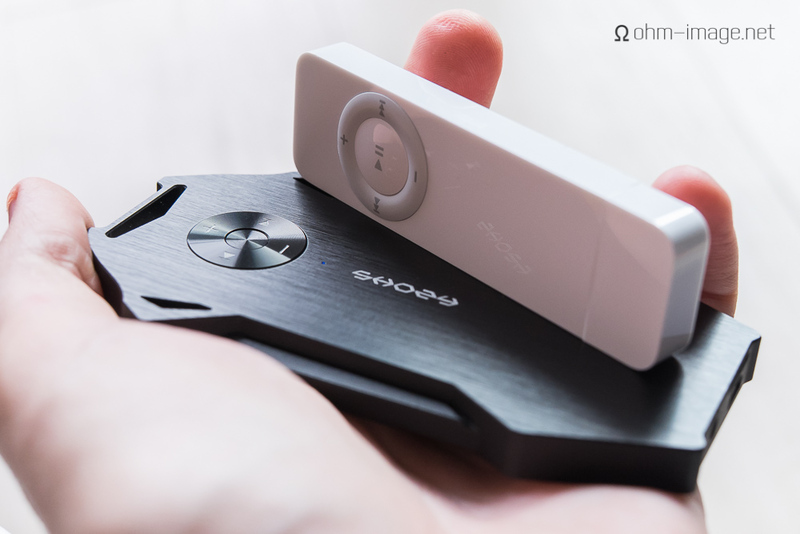 Some, like the Sansa Clip, sound great, are tiny, and pretty easy to use. Unfortunately, players of that ilk put in squinty screens and dizzy graphic user interfaces. Jaben's screenless players, you ask? One rant a day is enough. For today, let's stick to Shozy's Alien. Alien's face is the face only a Queen Mother could love. Its wings and hilts (my cousin said it looks like a sword 'handle') are neither comfortable to hold, nor are they useful in flight or fight situations. The bulk is just for show. A simple glance at its underbelly reveals that the circuit board is rectangular, not axe handle shaped. A 1st-generation iPod nano, comprised of SoC audio components, up to 4GB of storage, a screen, not to mention a hold button and an embedded OS, could fit inside the Alien with plenty of room to spare. And still it is much easier and more friendly to use. And who knows? Maybe the Alien makes use of an SoC. In which case, it is grossly oversized. Unfortunately, its size lends not a whit to user friendliness. Let's start with the play button that doubles as an ON/OFF switch. That button comprises roughly 1/5 the surface area of the iPod shuffle's play/pause button, despite cramming in double the responsibility. Accidentally bumping it OFF or ON is easier than you'd think. I don't have large thumbs, but even when I aim for the thing with a carefully-directed one, I'll be damned if I can hit it. This is bad design. And while the original shuffle's navigation pad is roughly the same size, its primary controls: volume, and tracking, are located on a separate, and raised outer rim. The play/pause button pops out perfectly for the thumb, which keeps accidental input to a minimum. This is good design. The shuffle switches ON/OFF via a switch located at the back of the device. To be sure, the Alien's fit-for-babies control tab looks shinier. Look at how shadows and light trisect it! Wow! Shininess: maybe that's what Shozy really wanted. More shine! If it catches the eye, good enough. Don't get me started on the Apple-wannabe packaging, which cautions you to "follow the user manual instructions", which has to be some sort of inside joke or something. There's no user manual, nor instruction booklet. I don't think in its current state I can in all conscience take Alien to Headfonia for review. It's not worth the time. Just as egregious are the holes in its firmware. Whether on purpose or not, when Alien turns off, it basically resets. (Great. Usually it runs pretty hot. It could use a cool down.) There is no resume function. Turn the player on again and it starts at the very beginning of the database. Have a 64GB card in there? Compressed FLAC files? Haha, joke's on you! It's time to clickety-click-click all the way back to that song you left after accidentally hitting OFF when trying to adjust the volume. Speaking of... every time Alien is switched on or off, its volume resets. Want to go back to the setting you had finally sussed before accidentally hitting off? You have to clickety-click-click all the way up, or down, to your comfort level. A long hold will not work. The good news is that if you happen to pull out your phones, the player won't pause playback. So you can clickety-click-click back down to safety before plugging back in. The good news is that a long press of the track forward/back buttons moves between albums. Long press: from Armin Van Buuren to Jay-Z. Long press again: from Jay-Z to MC Solaar. That's pretty cool. Wait... not so fast. After warping to a new album, Alien goes into an eternal single-repeat loop. Really like MC Solaar's "Lève-toi et rap"? Nothing better for it than endless repeat. Finally, some good news. Indeed, sound is very good. Hiss levels are lower than the iPod shuffle and signal quality is similarly high. Plug in any stupidly sensitive earphone you have, andy stupidly low-Ω balanced armature earphone you have, and whammo! Great resolution, incredible left/right control, great detail. In every area, its performance edges out the original shuffle, just not by a huge lead. Its hiss levels, however, are much lower from nine year-old iPod. I guess you could mention, also that the shuffle can't play 24-bit files. I would argue that if you really care about 24-bit, not to mention not blasting your ears by random restarts and blasts of volume, you probably aren't looking for a player like the Alien. I could be wrong. And as we know, Alien isn't capable of approaching the dynamic range, noise levels, low distortion, or stereo separation necessary for 24-bit audio. Anyway, if all you care about is stability under load and a good baseline of quality playback, Alien is awesome. But then, you probably are not reading this site. Shozy's Alien sounds good. Everything else is an embarrassing mess. If somehow you're still interested, head to Shozy for more information. The shiny earphones pictured above are the awesome-sounding Rhapsodio RTi1. The best screen-less player in the world? It still is the original iPod shuffle.